Next-Generation Fishing Boats: SUP and Fish? This mini-tower is unobtrusive, provides shade, and most importantly, will help you catch more fish. You want a better fishing boat? Of course you do – there’s no such thing as the “perfect” boat, and no matter which you choose there will be days when you wish it were different somehow. There’s one way, however, that many bay boats could be built better: if they had a tower installed. Check out this Yellowfin 24, to see what I mean. The tiny tower on this boat adds one heck of a lot of utility, yet very few bay boats have one like this. You say that shade and protection from the rain just isn’t that big a deal to you when you’re fishing? I’d often agree. The thing is, this little tower will help you catch more fish. 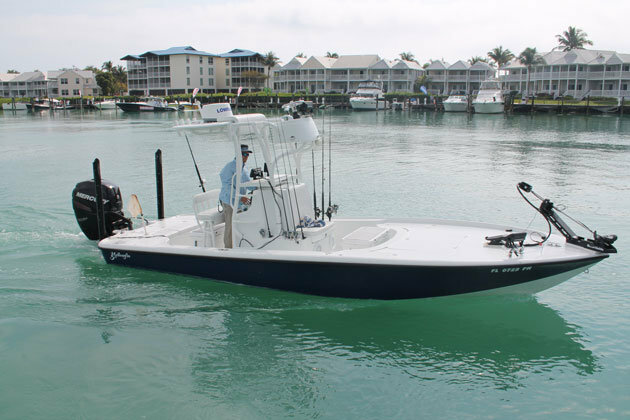 When I tested this boat in the Florida Keys, we were fishing live shrimp for grouper, snook, snapper, and tarpon. Standing on the casting deck, all I could see was water, water everywhere. Yet when the captain got up on the mini-tower, he was able to spot fish from 50 or 60 feet away. He directed our casts, and if we tossed our offerings where he pointed, as often as not we got bit. After a while I had to climb up and take in the view for myself. The difference in six or so feet of elevation was nothing short of shocking. All of the sudden I could see fish all over the place – a torpedo of a tarpon lazily swimming next to a bridge piling, several dark snook shadows inhabiting a slough, and mutton snapper zipping along the rip-rap were all suddenly visible. You want a better bay boat? One way to get it is by adding a tower. (Of course, the other goodies you see on this Yellowfin, like the bow-mounted trolling motor, twin Power Poles, and heavy-duty electronics help, too). Try fish-spotting from a tower like this for yourself, and I’ll bet you agree.